This shocking stat is enough to understand how risky are the lives of miners in India. According to the annual report of Coal India, 56 miners died in 2012, surpassing the previous year’s death toll of 51. The risk of accidents in mines is enormous and workers in mines can hardly take any precautionary measure against them. The peril may come in the form of collapsing of sidewalls deep in the mines or sometime a part of the roof falls on miners. The latter happened inside a mine in Kothagudem area in the state of Andhra Pradesh on 15th February, 2013 and crushed 2 miners to death. All these staggering facts trigger the necessity of a protection for those who risk their lives in the mines. And, there is no better safeguard for them than a personal accident insurance policy. By availing these policies, miners and their families can be compensated for casualties of different types that arise out of an accident in the mines. Yes, the concerned organizations compensate for such mishaps by paying a one-time lump sum amount. But, such compensation, more often than not, doesn’t meet the actual need. This is why, workers in the mines should look for an additional protection. Hence, it does make sense that miners opt for these policies and stay financially protected in case of any mishap. There are many insurance companies in India that provide personal accident policy. Unlike the life or health insurance plans where the premium amount is determined by the age of the insured person, premium and maximum sum insured amount of personal accident plans depend on the profession of the insured person. This is why, occupations are classified in three categories for a personal accident policy as per the risk factor. Miners belong to the ‘heavy risk’ category simply for the nature of their professions. Let us take a look and make comparisons of those policies that are available for miners to find out the best plan in terms of sum insured, premium amount and other parameters. The following comparison is made for a 32 year old hypothetical person who works in a mine with a monthly income of Rs. 20,000 and considering a sum insured of Rs. 5 Lakh. There are 5 insurance policies on offer as per the given criteria. All these accidental plans offer coverage for Death, PTD and PPD, however, 3 out of these 5 policies offer protection for Temporary Total Disablement or TTD. 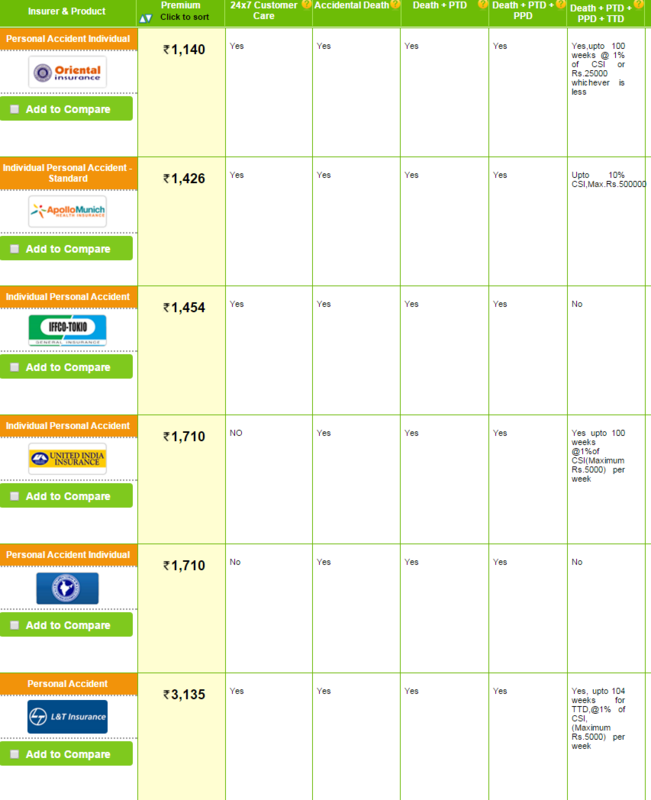 The premium amount varies between Rs. 1,140 and Rs. 3,135. So, one has to choose any 1 plan out of these 3 policies as per one’s budget. It is notable that, these policies are quite inexpensive. One doesn’t have to spend even Rs. 100 per month to buy and continue these plans. Workers in mines flirt with danger every single day and this expense is just next to nothing compared to their precious lives. Aside from miners, contractors and builders are also associated with hazardous professions. And the same goes for those engineers who are involved in superintending functions. The risk level of these professionals is considered as medium as per the norms of personal accident policy. Let’s see what’s in store for builders and contractors when it comes to availing a personal accident plan in India. The comparison is done for a 32 year old hypothetical builder with a monthly income of Rs. 20,000. The chosen sum insured amount is Rs. 5 Lakh. There are 8 insurance policies on offer as per the given criteria. All these accidental plans offer coverage for Death, PTD and PPD, however, 5 out of these 8 policies offer protection for Temporary Total Disablement or TTD as well. The premium amount is lot lower compared to the premiums for miners and it varies between Rs. 712 and Rs. 1.682 So, one needs to select the best plan among these 3 policies as per one’s budget. All builders, engineers involved in superintending roles and contractors should get a personal accident policy. God forbid, a mishap in a construction site may take away their lives or may have them paralyzed. Even a temporary disablement will stop them from earning for weeks or even months. To counter such unfortunate situations, these professionals are better off availing these accident covers. Compared to their priceless lives, the cost of these insurance plans is insignificant. As mentioned earlier, the premium for a personal accident policy depends on the nature of one’s profession. Since, working in mine is even riskier than working on a construction site the premium is also higher for miners than builders and contractors for the same sum insured. It is understandable that miners and builders work with busy schedules and they hardly have time for visiting insurance offices to avail a personal accident policy. For them, an insurance portal like GIBL that lets one compare and buy policies from a single platform is perfect. It takes a few minutes to submit details and get a list of policy quotes. Then, a miner or a builder can select the best cover as per their requirement and make the payment online. 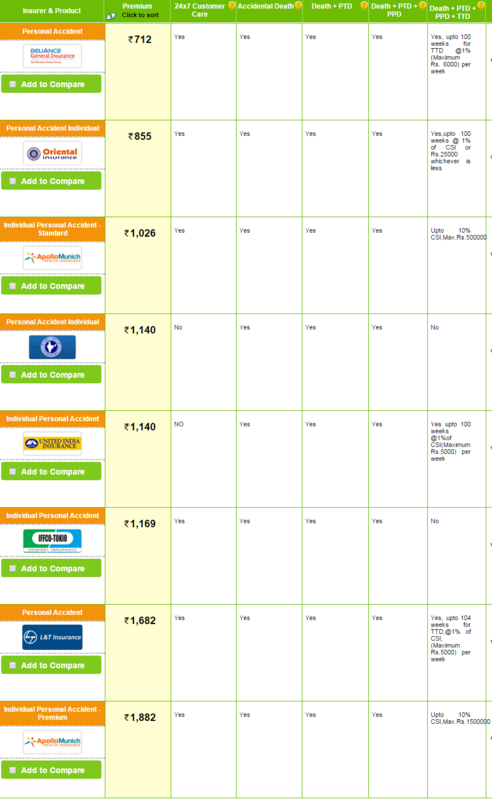 IRDA approved insurance comparison portals that allows for the purchase of an insurance policy are armed with multiple safe payment gateways so policy buyers need not to worry about paying online. The soft copy of policy paper will be issued and sent to them instantly after making the payment. Dangers are unavoidable, so it is better to be prepared in advance for adverse situations. A personal accident policy is undoubtedly the best way for miners and builders to protect themselves and their families economically if and when any unpleasant incident occurs.